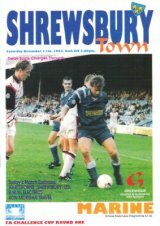 On Saturday November 11th 1995 Shrewsbury Town hit a club record score when they beat Marine 11-2 at Gay Meadow in the First Round of the FA Cup. On the same day and in the same competition Oxford United also recorded a club highest score with a 9-1 home victory over another non-league side, Dorchester Town. Another high-scoring FA Cup tie at the Bescot Stadium. In a 2nd Round replay between Walsall and Torquay played on Tuesday 12th December 1995 the sides were level 4-4 at the end of 90 minutes but the home side scored 4 goals in just 8 minutes of extra-time to win 8-4.